Colin’s background is as a field service engineer in the mechanical, electrical & electronics trade. 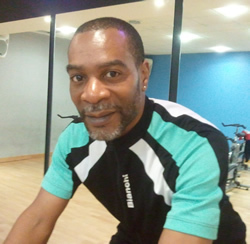 Having always enjoyed sports at school, first swimming, then football, he qualified as an aerobics instructor in the early nineties when coming to the end of his footie playing days. "Since qualifying as a Personal Trainer and Spinning coach four years ago, the Spinning® program has radically changed my approach to cardiovascular training. My goal is to enthuse participants with the knowledge to train smarter, not harder." Colin teaches with an infectious passion and enthusiasm and loves passing his knowledge onto class participants. Colin is a keen cyclist and has set himself the personal challenge of doing the Bristol to London Bike Ride this year.